The applied surgical method “Targeted Sensory Reinnervation”, a selective transfer of sensory nerves was established after Todd Kuiken, Rehabilitation Institute of Chicago. The patient Wolfgang R. from Upper Austria underwent “Targeted Sensory Reinnervation” by OÄ Dr. Eva-Maria Baur and OA Dr. Thomas Bauer at the University Clinic for Reconstructive Plastic and Aesthetic Surgery in Innsbruck which is a cooperation partner of the FH Upper Austria. During this procedure sensorial nerve endings of the original foot were reactivated to serve as an indicator for pressure on the sole of the prosthetic. The main goal of the operation was to decrease pain from neural scarring (neuroma) by redirecting the nerves.Due to the neural interface the patient has feeling on the sole of the prosthetic foot and therefore manages much better to recognize the nature of the ground he is walking on. There is also more awareness of obstacles, which greatly reduces the risk of falling. The re-established transfer of information also contributes to a more natural integration of the prosthesis into the body concept of the patient and, in this case, has led to the complete disappearance of previous long lasting pains. 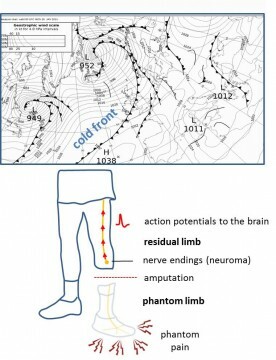 Many amputees may suffer from limb phantom pain symptoms ranging from mild to extreme pain felt in the area of the amputated limb. Residual nerve endings (neuroma) continue to send action potentials to the brain. This leads to a kind of feeling as if the limb were still there. Often, the feeling is so strong or even unbearable that it is being felt as limb phantom pain. 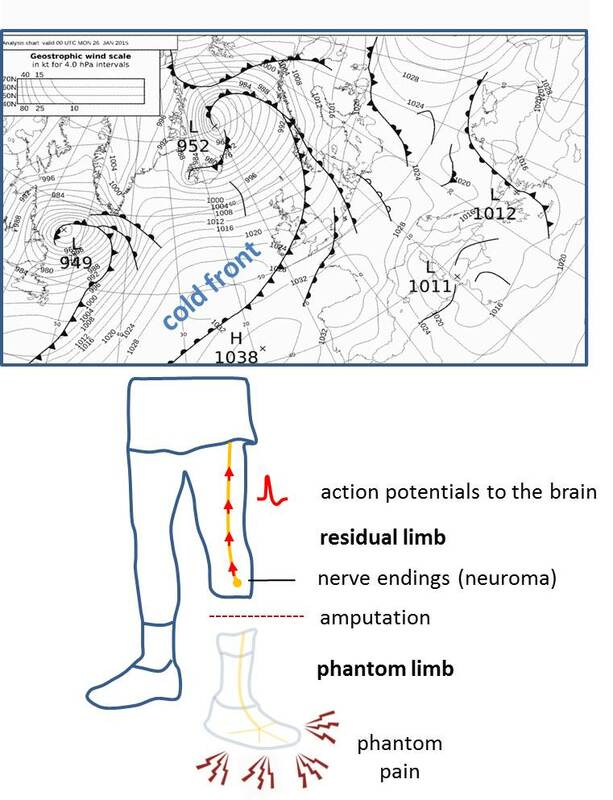 Affected people also complain about the limb phantom pain strongly correlated with weather deterioration – a phenomenon which is still unexplored. The goal of the objective project is to find out the primary causes responsible for meteoropathy. 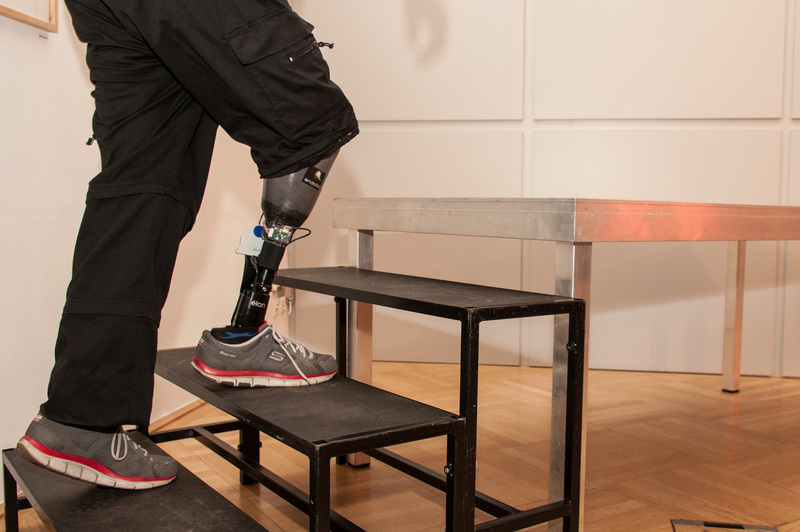 As the classification of limb gestures and movements is partly possible with pattern recognition methods, prostheses are being developed using this strategy. However experience has taught us that changes of skin-electrode properties such as skin artefacts due to sweating, skin movement or electrode displacement increase the error rate significantly. Unfortunately, this makes a prosthesis using pattern recognition methods unreliable so that users often wish more simple and robust control methods instead of sophisticated ones. 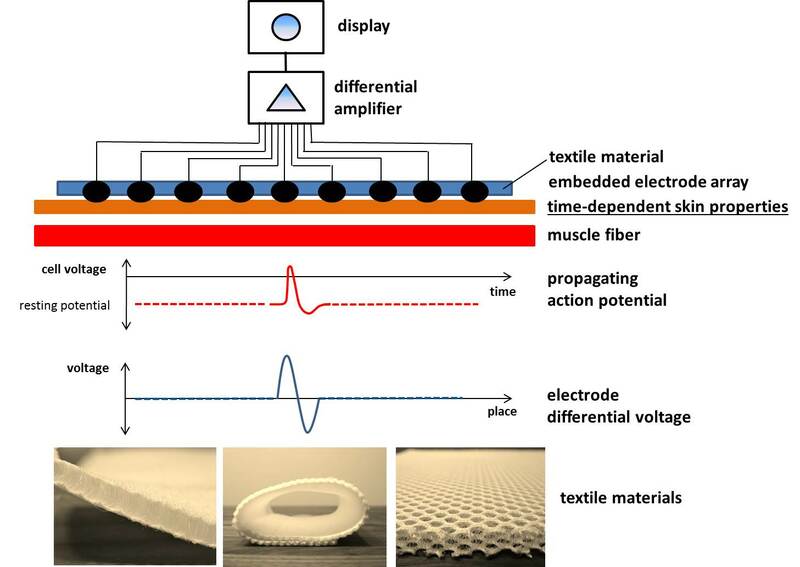 The goal of this project is to design and test surface electrodes delivering signals broadly independent from skin artefacts. Well established myo-prostheses use co-contraction commands ideally given by s1(t) = s2(t) to route the EMG-control-signal to the different joint’s motors. Although the method is rather robust once it is learned some users may still have problems to evoke predefined command signals. As the characteristics of real signals depending on the amount, orientation and scarring of the residual muscles strongly vary mainly elderly people can have difficulties to perform the command signals s1(t) = s2(t). 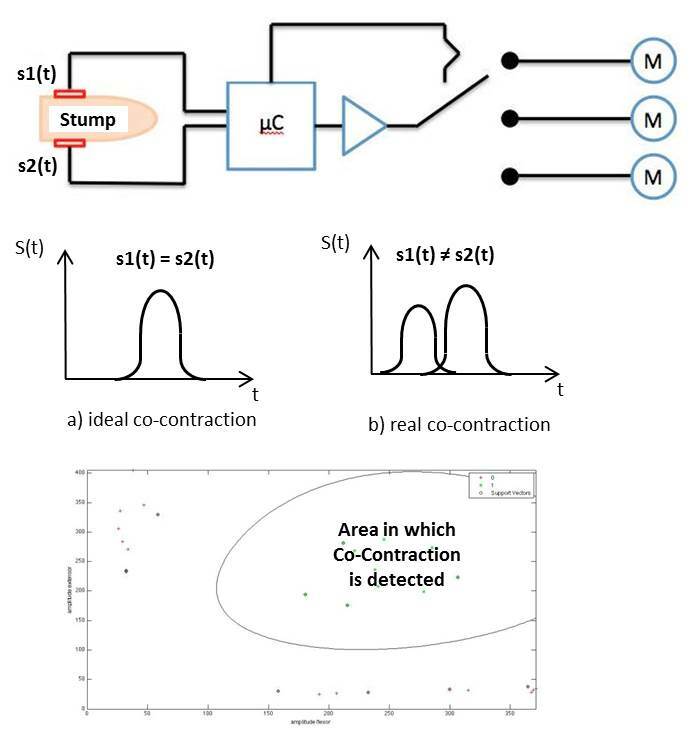 The goal of this project is to improve the individual’s reliability of co-contraction by using pattern recognition methods. Students at Bachelor as well as at Master level are encouraged to apply for an internship or a master project. New student projects are posted under Category: Students.